"A delicious bread that always gets happy faces! Leave the peels on the apples for added taste and color." Preheat oven to 350 degrees F (175 degrees C) and lightly grease a 9x5 inch loaf pan. In a large bowl, combine flour, sugar, baking powder, salt, cinnamon and cloves. In a separate bowl, mix together milk, egg and oil until well blended. Stir milk mixture into flour mixture. Fold in apple. Pour into prepared pan. Bake in preheated oven for 1 hour 20 minutes, until loaf springs back when touched lightly in center. Cool in pan 10 minutes before removing to wire rack to cool completely. Watch how to bake a batch of apple muffins for breakfast or dessert. Excellent bread, but I will definitely use about 1/2 the amount of cloves next time. Makes WAY too much for one loaf pan. Also, there's so much baking powder you can taste it in the bread. I would try making it again, but next time will cut back on the amount of baking powder. Very easy and tasty. I like not having to peel the apples. Mine was done about 15 minutes earlier than it was supposed to be. I love this recipe! Absolutely delicious and low fat too. It's firm enough to be toasted - wonderful for breakfast. Great tasting recipe. I made mini muffins with the batter also that came out wonderfully moist.Same bake temp. about 10-12 min. I followed this recipe exactly, and my family and I agreed it was just so-so. It tasted pretty bland to me. I'll probably try a different recipe next time. I think that this is a great recipe. Me and my boyfriend enjoyed the bread very much! 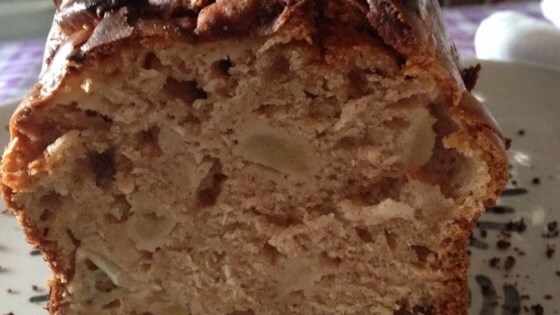 What a great quick bread. We all loved it. I know I'll make it again. Thank you for sharing this one. Cheers!! very easy to prepare, smells great baking!